Search engines love descriptive and clean file names for images. File names with uncommon characters can break images in browsers. If you upload a lot of images running a non-english website or allow users to upload images, then it is not possible to ensure clean image file names for every image. 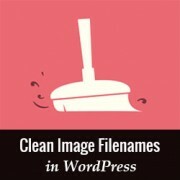 In this article, we will show you how to enforce clean image file names in WordPress. Hopefully, this will help you improve your site’s image SEO. First thing you need to do is install and activate the Clean Image Filenames plugin. Upon activation, simply go to Media » Add New and try uploading a file with accented characters. For example, we tried uploading an image of bilberry which is called Çay üzümü in Turkish language and our filename was 'Çay üzümü.jpg'. After the upload, this image filename was filtered by the plugin into 'cay-uzumu.jpg'. You can still use the accented character in your image’s description, alt and title tags which will help search engines to find the image when someone uses the actual Turkish characters to search the image. Unfortunately this plugin does not automatically fix your old images. It filters the image title immediately after the image upload is finished. If you run into any issues, then don’t forget to look at our guide on how to fix common image issues in WordPress. 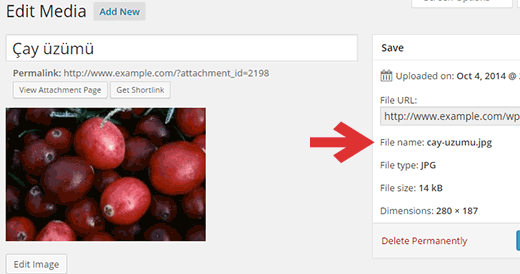 We hope this article helped you learn how to enforce clean image filenames in WordPress. You may also want to take a look at our guide on how to speed up WordPress by saving images optimized for the web. Thanks, that’s an interesting plugin, but I’m not sure I can think of cases when uncommon images may break images in browser. Could you give a few examples of that stuff happening, please?